Rabbi Ettinger passed away from his wounds in the terror attack—which began with a stabbing and turned into a shooting at multiple sites—after initially being hospitalized with critical wounds. Israeli President Reuven Rivlin actually was able to visit his family at the hospital, who were praying for the rabbi’s recovery. Thankfully not all of the victims wounded in the attack have succumbed. 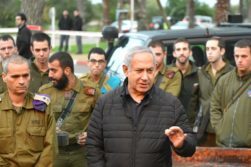 Netanyahu expressed his wish for a “quick recovery” to the third Israeli victim wounded in the attack.